KANSAS CITY, Mo. 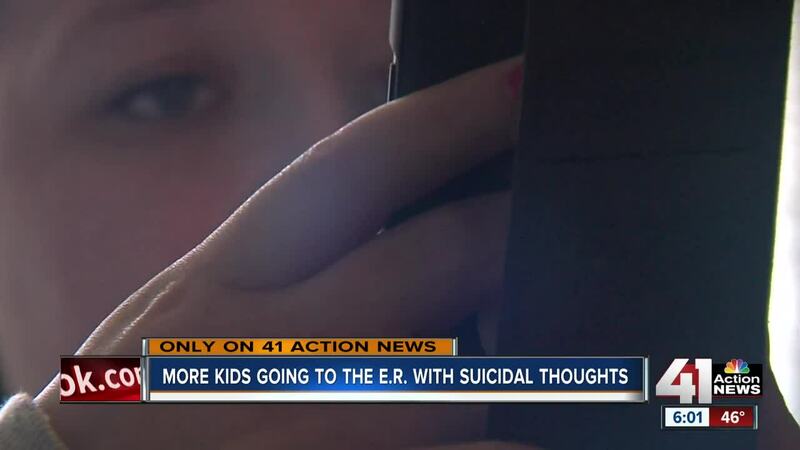 — Children's Mercy Kansas City, like many other hospitals across the United States, is experiencing an increase in the number of children and teens who visit the emergency room with suicidal thoughts or after suicide attempts. Children's Mercy hospitals treated 1,736 patients who required a suicide assessment at its emergency rooms from July 2017 to June 2018, a 39 percent increase from the previous year. The average age of the patients is 13 years old, according to Kathryn Worland, the assistant director of social work for Children's Mercy's Child and Family Mental Health Services. "We have seen someone as young as 3," Worland said. No single reason accounts for the increase in depression and suicidal behaviors among children, but one contributing factor may be increased stress and pressure on kids. "We're seeing a lot of pressure at school, also the pressure of social media," Worland said. "Kids really can't escape that. They have these avenues to have 24/7 access to each other with social media." Other reasons for the spike may include increased cyberbullying, the pressure to attain perfection, or underlying mental health issues. However, some people examine the data and believe the increase is fueled by eliminating the stigma of suicide. "If the ER visits are because open and honest conversations are going on and parents are willing to listen, go in and get their children assessed before something terrible happens, then I view it as a good thing," Jan Marrs said. Marrs lost her daughter, Lane, to suicide in 2016. She subsequently joined Speak Up , an organization that seeks to reduce the stigma surrounding mental illness and increase awareness for suicide-prevention efforts. Marrs and experts at Children's Mercy Kansas City advocate for parents to engage in continuous conversations with their children. "Ideally, you're paying attention and listening early enough, so you're not ending up in the ER," Marrs said. "You hear that your child is sad and you start taking them to a counselor. You start addressing the issue, so you don't end up in an emergent situation." National Suicide Prevention Lifeline : A 24/7 phone network that provides free and confidential support for people in crisis at 1-800-273-TALK (8255) . Crisis Text Line : Text "TALK" to 741741 to connect with a trained crisis counselor from for free 24/7. More resources can be found on the American Foundation for Suicide Prevention website .